A Special Response Team shattered a family’s window in the middle of the night, hurled a flashbang onto a couch next to a sleeping girl, then charged in and shot her in the head. The hyper-aggressive tactics were made worse by the fact that police had taken it upon themselves to raid both sides of a duplex, when their suspect was only known to reside in one of them. On the evening of May 16, 2010, the Detroit Police Department’s Special Response Team (SRT) prepared for a surprise raid to arrest a wanted man. A surveillance unit had been monitoring the duplex in which he lived throughout the day and a no-knock raid was scheduled for just after midnight. Police neglected to account for — or flatly disregarded — the safety of any potential children that might be present. Besides the glaring presence of toys strewn about the lawn and front porch, it is unlikely that investigators could have missed the presence of four young children and multi-generational family in the opposite unit during their surveillance of the duplex. The raid commenced at roughly 12:40 a.m. The Special Response Team arrived in its armored vehicle with a warrant to arrest Chauncey Owens, who was known to stay with his fiancée at 4056 Lillibridge Street. Armed with MP5 submachine guns, adrenaline, and an unhealthy fear for officer safety, the raiders shuffled past the toys that littered the front yard and ignored the two distinct street address signs hanging on either side of the shared porch of the multi-unit building; 4056 was on the left, 4054 was on the right. 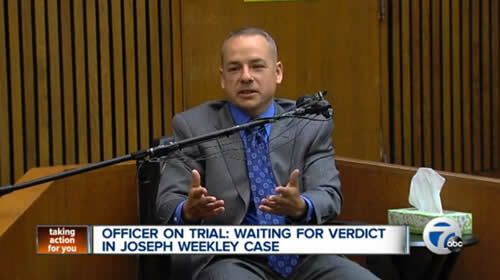 Detroit police officer Joseph Weekley was spared a felony conviction on Tuesday over the killing of a 7-year-old girl after a jury deadlocked and a mistrial was declared,according to Detroit Free Press. Weekley shot and killed Aiyana Stanley-Jones on the night of May 16, 2010, as officers executed a search warrant on the duplex her family lived in. 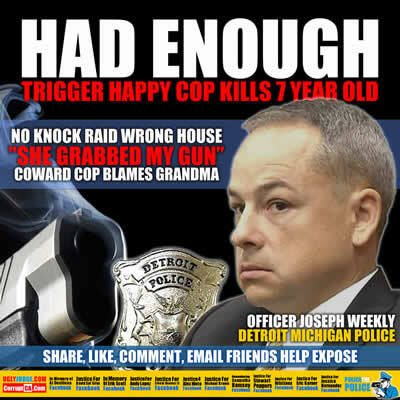 The officers entered Stanley-Jones’s home searching for a murder suspect who was later found in the adjacent unit, throwing a flashbang grenade into the room where the girl was sleeping with her grandmother, then shooting her in the head seconds later.